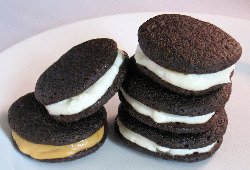 Our Sandwich Dog Cookie Recipe with Cream Cheese filling is a deceptively easy dog treat recipe. Your friends will think that you purchased these gourmet dog treats for several dollars a piece. But you'll know that they were easily whipped up in your kitchen for a fraction of the cost. Customize this dog treat recipe to match your needs. Make each cookie smaller, and the eventual dog cookie sandwich will be smaller for a smaller dog, or for a dog who's watching his waistline. If your dog is sensitive to milk products, you can still make this dog cookie recipe. Substitute the cream cheese with a tofu cream cheese or make the peanut butter version of the filling. For the milk, use a non-dairy milk like soy, almond or coconut. You've found a great dog treat recipe to make for your dog. You have all the ingredients, and now you're ready to preheat the oven and get to work. But wait, you don't have a paper recipe to look at to help you in the kitchen with each step. Now you do! We have a printer friendly option on the far left hand side of every page. It looks like a little white and green printer. Click the button and choose exactly what you want to print. There are options to remove all images, create a PDF or even email the recipe to yourself or another dog parent. Try it out and get baking the best homemade dog treats for your dog! Start a Dog Bakery - How? Starting any small business, even if it's a truly fun one like baking dog treats, can be quite daunting. how much should I charge for my treats? how will I test new recipes? how will I market my dog treats? where will I bake my dog treats? And these questions are just the beginning. But, worry not, I've read and reviewed a great eBook that can help you answer all these questions and many more. If you've been a long time newsletter subscriber, you've probably heard me talk about the eBook Bake a Dog a Bone - Turning Your Passion for Pets Into Profits. I continue to talk about it because it really is that good of a book. There are so many pearls of wisdom all throughout the book that help you to answer the question that may be nagging in your mind, "I love to bake dog treats, I wonder if I can make it into a small business?" Read my review, and check out testimonials on their site that may help you get started on a new path of being a small business owner. You may have your trusty apron that is covered in stains from meals gone by. But baking for your dog is special, and deserves a special apron. Here's an adorable option that is dark enough to cover stains and yet super cute with illustrations of dogs. You can also get the matching pot holders and towel! "Since I found this site, I've been baking like crazy for my doggies (Sasha & Deuce). They absolutely love these treats! When allowed in the kitchen they sit & stare at the oven as if they know I'm baking for them. Also, I've saved money by doing this which I love & it feels good knowing that these treats are healthy. My doggies & I thank you & look forward to our next newsletter, can't wait!!!"